Home / QuiBidder of the Week – Sally B. You don’t have to wait until you get a lot of good wins to be QuiBidder of the Week, because each new win is a new story to tell. This week’s QuiBidder of the Week is Sally B. from Canada. 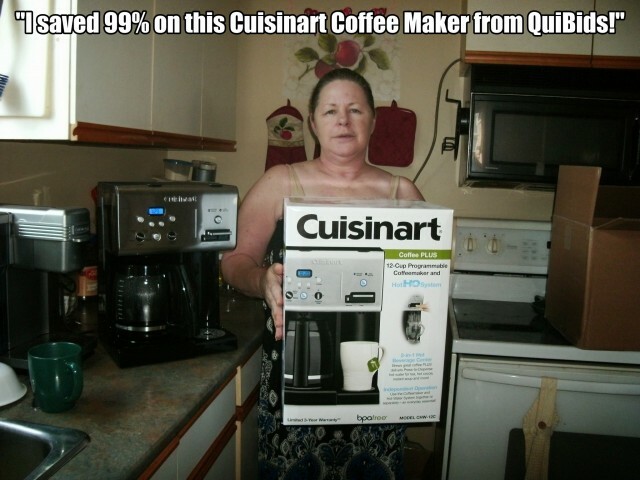 Continue reading to learn how Sally saved 99% on the coffee machine she got from QuiBids. Do you want to be the next QuiBidder of the Week? The next time your QuiBids Win comes in the mail, take out your camera and snap a picture with it. Then submit your photo here and tell us a little bit about it. If you’re photo is chosen, you could be the next QuiBidder of the Week and win a $50 gift card of your choice! Tell us about your QuiBids Win. Congrats again Sally for being named our newest QuiBidder of the Week! Don’t forget to congratulate her as well in the comments below. QuiBidder of the Week – Alissa M.